White-tailed doe giving the hard stare. White-tailed deer in a northern forest. White-tailed fawns in the early morning fog. Muskrat on an April day in northern Wisconsin. White-tailed doe standing in the winter snow. 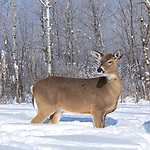 White-tailed doe standing in the deep winter snow. Black-capped chickadee in northern Wisconsin. 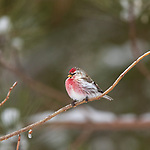 Common redpoll in northern Wisconsin. White-tailed doe standing in the Wisconsin snow. Common redpoll perched in a speckled alder. White-tailed doe walking in the deep winter snow. White-tailed doe licking a branch. White-tailed doe in a winter forest.